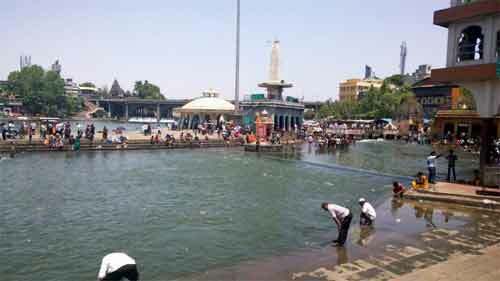 Immersion of the ashes of the dead after funeral rituals in the Asthi Kund adjacent to Ramkund in Godavari River at Nashik in Maharashtra is considered as one of the rituals that gives peace to the soul of the dead in Hinduism. The holy Asthi Kund at Nashki is a small pond, 3X3 feet, adjacent to the Ramkund. It is believed that the Asthi Kund is more than 100 feet deep and has natural springs and the mortal remains that are immersed along with the ashes are dissolved here. Ramkund is considered to be holy because Godavari River turns to the right in 90 degrees at this place. It is also believed that Sri Ram used to take bath at Ramkund during his exile period in the Ramayana. Hindu tradition also states that a drop of nectar from the pot which was being carried by Garuda after the Gods had won it from the demons during Sagar Manthan (churning of the ocean) had fallen at Ramkund. This is another reason why the place is very sacred. The tradition of immersing the ashes in the asthi kund, is being followed since ages. People from all over India and world come to Asthi Kund for immersion of the ashes of their loved ones.